Is having an online presence important or useful for your organization? Then creating a business website is one of the first steps you will take. It is one of the easiest and most cost-effective ways to find clients both locally and around the world. So how do you actually create a website? We will take you through the ten key steps. First, let us look at why you should build your business website using WordPress.org. 31% of all websites run on WordPress. With nearly two billion websites in the world, that is a lot of users putting their confidence in WordPress. Websites small and large use WordPress. From personal blogs to large newsgathering sites like CNN, WordPress can handle all types of sites. Get the look you want. You can create a unique style for your website by utilizing thousands of free and paid themes available for WordPress. Huge community available to support you. WordPress users can access help and support from one of the largest Open Source communities consisting of developers, writers, editors, and designers. You will find no end to the amount of assistance available in the community’s support forum. 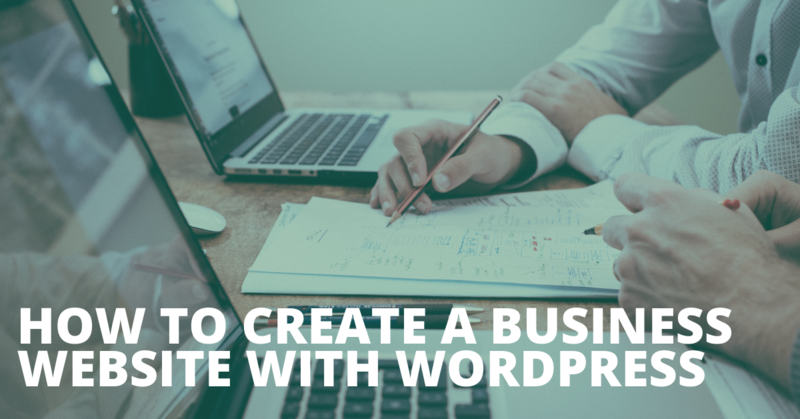 If you are a small business operating on a tight budget, using WordPress helps you build an online presence more easily. The WordPress Open Source CMS is free to download and use. You need to pay for your domain, hosting, and maintenance (if you choose to hire a developer). Now that you have chosen WordPress to help run the website for your organization, we will explore what you will need to build it. An email address where prospective clients or customers can contact you is a vital part of having an online presence. It may not look as professional if you use a personal email address. You can purchase a domain name through a domain name registrar. There are a number of registrars available. Each one is equipped with its own set of features and comes with a number of advantages and disadvantages. Once you have identified the one that fits your organization, you can pay to register your domain name for a set period, from a year to a maximum available from that particular registrar. Many of the domain name registrars will also offer email addresses for your business at an additional cost. While you are viewing the benefits of each registrar it is a good idea to see which email package fits what you require based on the number of accounts you can create and amount of storage you might need. Now that you have your name and contact details set up, it is time to think about exactly what you want from your website. It can be beneficial for an organization to have an online presence. But do you know what you want it to achieve? A starting point is to consider what makes your offering unique. In other words, why will people want to buy your products or services? One of the best ways to do this is to write one clear sentence outlining your company’s value proposition. The next step is to plan what your website will include. This can include text, images, selling or sign-up options. Make a list of the features and functionality you will need. Do you need an FAQ page to answer complex questions? What about a blog? Do you need an eCommerce option to make online sales? Do you need a contact form? This screenshot shows how you can add pages to your website using WordPress. A strong brand is important for businesses of all sizes. It improves recognition of your organization and fosters confidence in it which, in turn, can generate more repeat customers. The first step is to design your logo which is consistent with your existing brand or helps you define one for your company. If you do not have an offline logo you can adapt for the web, you can either design one yourself using a graphic editors or hire a design agency or freelancer. The style and wording that form part of a logo are aimed at reflecting your business and its offerings. You will want your logo to reflect your company in a meaningful way and this can be discussed and developed as you explore what you want through the design process. Another factor to take into account is your logo’s color — something you will also need to think about for the website as a whole. Different colors create different emotions for customers. Are you creating a youthful brand or one that is a bit more mature? Your color palette can help you develop and market your brand. Web colors are different than the ones you work with offline. There are a number of online palette tools which can help you choose web-friendly and accessible colors, find schemes which are close to your printed publication ones, and better understand how different audiences may react to your choices. How will you build your site? There are two general approaches to building your business website — either doing it yourself or hiring a developer to help with part or the entire project. If your knowledge of coding is mainly basic HTML and CSS, you can build your business website using WordPress or using a drag and drop WordPress page builder. Page builders allow you to customize much of your website without having to write complex coding yourself. However, while page builders are much more powerful nowadays, they still come with some limitations. The new WordPress Editor named Gutenberg has features aimed at supporting you in developing your website pages and posts through the use of blocks. If you have limited time and would like to work alongside a web specialist, you can hire a developer, web designer, or a web content builder familiar with using the WordPress CMS. When hiring a developer, make sure they have have a track record of building reliable, fast websites, is aware of mobile-design and has an understanding of search engine optimization (SEO). Who will host your website? You will need a hosting space for your website. This is where the website will live. You can start by reviewing the hosts recommended by WordPress.org. Think about the look and feel you want to have for your website look and and how it is going to fit in or change your existing organization’s branding. ●	is it being regularly maintained? ●	are other users of the theme satisfied with what it offers? ●	does it support your chosen plugins? ●	will it help make your website easier to find by search engines (more on this later)? What content will you add to your website? What will appear on the landing pages (the webpage visitors reach when they follow an external link to your website)? When creating content, think about how people will find your information when they are searching the internet (more on search engine optimization below). How do you get people to find your site in the first place so that you can engage with them and encourage them to spend time on the content you are providing? Developing a solid search engine optimization (SEO) strategy is vital. There are lots of good templates available which can be adapted for an organization’s needs and incorporate useful tips from members of the WordPress community. By following a SEO strategy, you will be helping potential customers find your website through their online searches, which in turn can improve your sales conversions and increase brand awareness. There are two avenues you can go down to increase search traffic: paid or organic. Paid search involves an advertising budget to increase a search engine result when someone types in a word or phrase. Organic search is based on publishing content using good SEO practices. An effective way to organically optimize your results is by researching “long tail keywords.” To illustrate, a shoe company may want to rank first for “shoes” as may thousands of other firms. Given the popularity of the keyword “shoes,” you would need to spend a lot of money to rank well for that specific term. assist you in developing new content and promotion opportunities as the maps can help identify what other pages should link to each other and the keywords you are using on different pages. Now that you have your SEO strategy planned, you will need to ensure that your website is capable to support your needs in delivering it. WordPress plugins are like apps which you can use to add new features and functionality to your website. Plugins need regular updates to gain new functionality and to help keep your website secure. and through a number of other functions. The screenshot above shows examples of the plugins you can use on WordPress to boost your SEO. Once you have set up your website, you can build and submit your sitemap to Google, Bing, Yahoo (via Bing) and other search engines to make it easier for them to find your site’s pages. How can you optimize your site? All that hard work of attracting customers to your website can be diminished if it performs poorly. Users are often only willing to give you seconds of their time before leaving a web page. Here are just some of the checks you can make to help your website run smoothly. find out how visitors with accessibility needs use your website and make it easier for them. If you are not experienced in web development, you can talk with a professional web developer to help optimize your website’s performance. Following these introductory 10 steps will help you highlight your business to new audiences and customers. By using WordPress, once you have your basic site you can add more features and content to expand your online presence. Get started today by downloading WordPress.org and enjoy building your new site. Thanks to @joelobo and @webcommsat for writing this guide, and the businesses that worked with them. Also thanks to @mcdwayne, @harryjackson1221, and @bridgetwillard of the marketing team for their contributions to it.